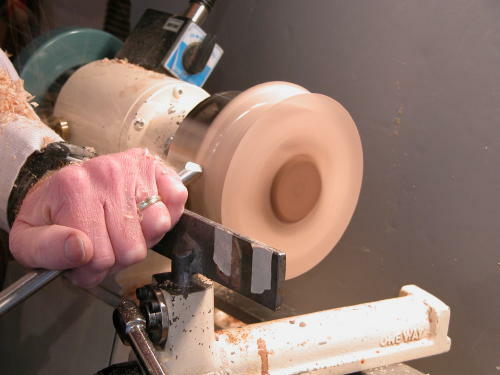 These articles were published in the Winter 2004 edition of Woodturning Design. 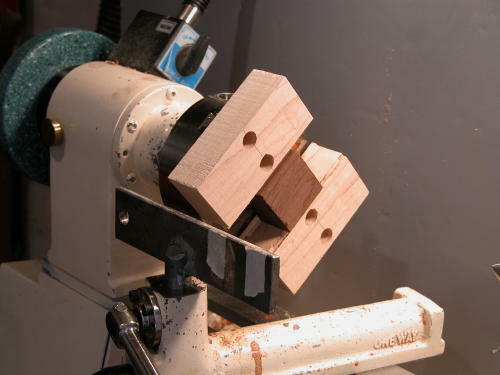 This article is in two parts: Two Jaw Chuck describes making a set of wooden jaws for offset turning. Business Card Case describes making a business card case using the Two Jaw Chuck. Multi-center or Eccentric Woodturning can open up a whole new world of woodturning design <ahem> for you to explore. There are several special purpose (and rather expensive) chucks you can buy. 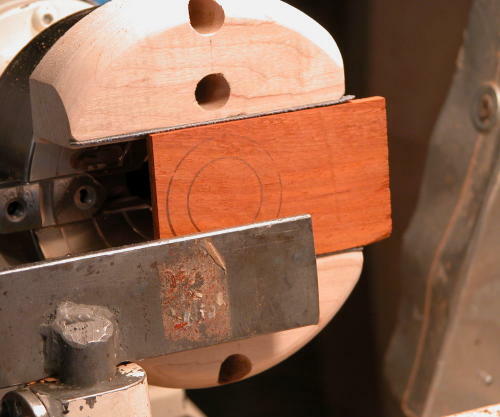 But if you already have a four jaw chuck, and don’t mind reasonable limitations on the size of your work, you can begin to explore this world for only the cost of a small amount of hardwood and a little time. 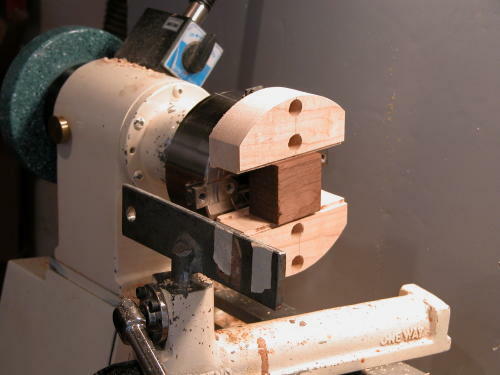 This article describes how to make and use a pair of wooden jaws that will fit on your four jaw chuck. The Jaws are made so that the faces have two steps, a shallow one and a deep one, to help align your work when mounted in different ways. The mounting holes are deeply countersunk so that you can use your existing mounting screws. 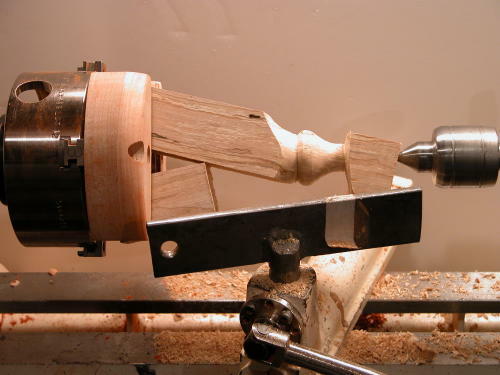 The shallow steps are used when mounting thin wood directly in the chuck. 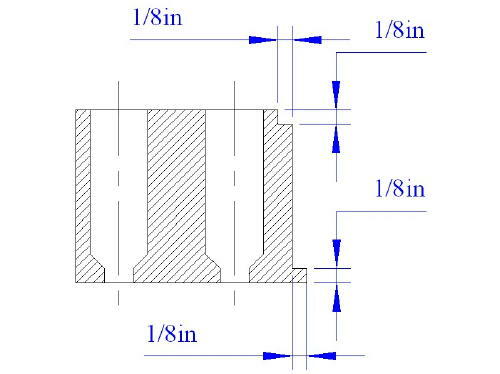 The deep step is used when using a glue chuck (or screw chuck, etc) to hold the work, or when using the Two Jaw Chuck as a drive center to obtain a greater offset than can be obtained with standard drive centers. A word about safety: Eccentric woodturning is inherently unbalanced. If you have a variable speed lathe, always start your lathe at a very slow speed. If your lathe only has fixed speeds, try the slowest speed you have first. Which ever system you have, make sure you stand away from the headstock when turning the lathe on. Aside from having enough jaw area to grip securely, there’s no mandatory size for the jaws. I rather arbitrarily made them as long as the diameter of my chuck body, and half as wide; 4 inches long, 2 inches wide. I used stock that was 1-3/8 inches thick, but anything more than 1 inch and less than 2” thick would do. Start with a piece of strong hardwood, such as Maple, long enough to cut two jaws from (and to rip safely), in my case 9”. 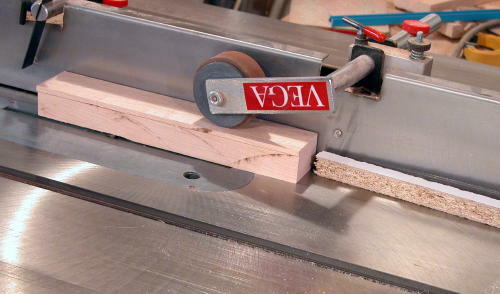 Set the rip fence on your table saw to 2” (or the width you choose) and rip the piece. Now reset your blade so that it is set to a height 1/8” less than the thickness of your stock, and set the rip fence 1/8” less than the last cut (1-7/8” if you started with 2”). Since this is not a through cut, you’ll have to remove the standard blade guard and kick-back pawls. I have an after-market fence that gives kick-back protection even with the guard removed; if you don’t, be careful. Make another pass through the blade. This will create a deep step on the face of the jaw blank. Now reset the blade height to 1/8”, and move the rip fence in another 1/8”. Make the third pass on the saw. This will create a shallow step on the face of the jaw blank. Fig01: Cutting the bottom ridge on the jaw stock. 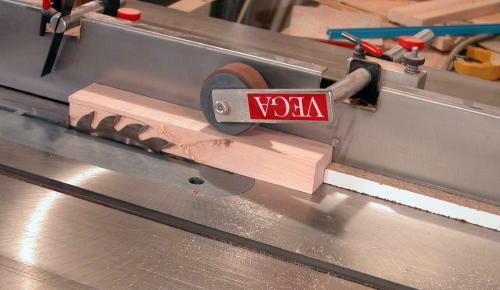 The table saw splitter has to be removed for this cut, but my after-market anti-kickback system can still be used. If you do without, consider using two push sticks. The last step in cutting the jaws is to cross-cut them to a 4” length (or the length you choose). The first step in drilling holes to mount the jaws is to determine how far apart the holes have to be. It’s not possible to accurately measure from the center of the holes since you’d be guessing where the center is. Insert a mounting screw into both holes of a base jaw, and screw them both in all the way finger tight. Measure from the inner side of the head of the inner screw to the outer side of the head of the outer screw. Then measure the diameter of the head. 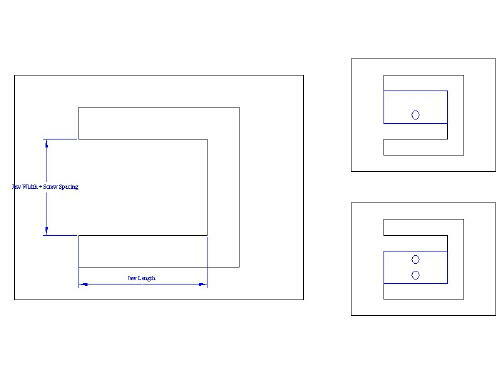 Subtracting the head diameter from the first measurement gives you the spacing between the holes. Now that you know the spacing, mark the hole locations on your jaws. They should be on the midline, about as close to the inside edge as you can get without having the countersunk hole breaking through. 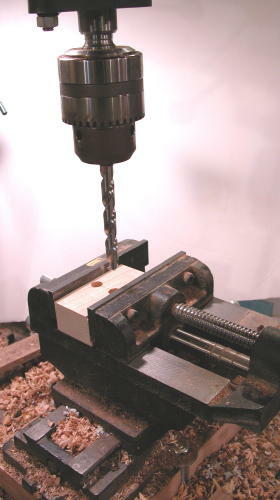 Drilling should be done with a drill press with the jaw clamped in place. You just aren’t going to be able to drill accurately enough any other way that I know of. You will need to drill twice at each location. The drill size depends on your mounting screws. For the body drill use a drill that is a little larger than the diameter of your mounting screws. For the counter-sink, use a drill slightly larger than the head diameter of your mounting screws. 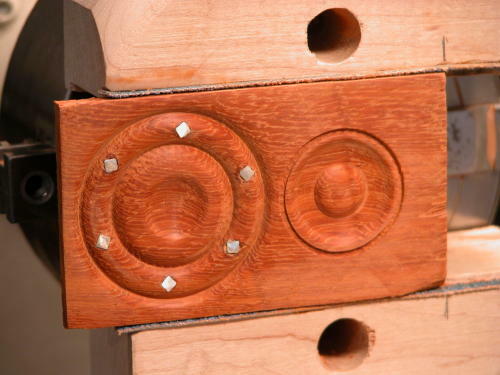 I used ¼” and ½” for my One-Way Stronghold Chuck. Whether you should drill with the body drill or countersink drill first, and whether you should do all of one and then all of the other, or alternate without unclamping the jaw is arguable. I’ve made several jaws and I can’t say that I’ve done it the same way each time. Just don’t try to drill freehand. I do suggest that you check the depth setting for the countersink drill after drilling the first hole to make sure enough threads are exposed for a secure hold. If the spacing of the holes is a little off you can probably fudge things with a small round file. If the holes are way off, then you’ve wasted 20 minutes and 50 cents worth of wood; just try again. A drill press jig might make things easier. You can easily make one from 3/4” plywood. First make a base that you can clamp to your drill press table. Make a face piece that is shaped like a sideways “U”. The arms of the “U” should be as long as the jaws. The spacing between the arms should be the width of the jaws plus the width of the hole spacing. Screw the face piece to the base (don’t use glue in case you have to make adjustments).To use, simple hold the jaw against base and top arm. Move the base on the drill press table until the drill is lined up with the bottom hole and clamp in place. Drill, slide the jaw down so that it is against the base and the lower arm, and drill again. You can try it on a test piece that is exactly the same width as your jaw first. If the hole spacing is to wide then add shims. If the spacing is too small, remove the face piece and trim a bit off the inside of one arm. With the jig your positioning should be repeatable enough that you can drill all the holes with the body drills first. Then drill one hole with the countersink drill and check the depth, and then drill the rest of the countersink holes. After you’ve drilled all the holes, mount the jaws on your chuck. It helps to start the second screw of the jaw before tightening the first. Open up the jaws and clamp a scrap piece between the jaws that’s approximately the thickness of the stock you expect to use. If you attempt this without clamping a scrap block you may find that the jaws will open as you turn. 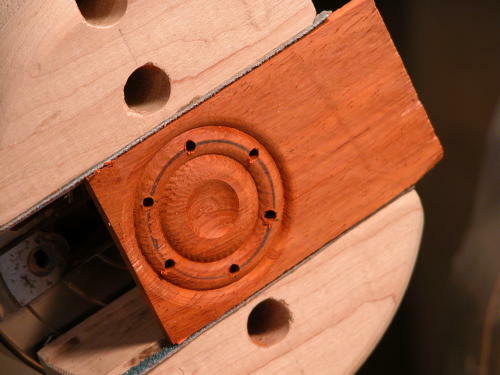 Mount the chuck on your lathe and turn the outside round or almost so, using a bowl gouge. You’ll probably also want to turn a bit of a radius on the outside face to make it less damaging to your fingers. With the lathe off you can put a small radius on the side corners with a file or coarse sandpaper in another effort to make the jaws finger friendly. Remember at all times that the holding power of wooden jaws is less than metal. Keep your work to sensible size. Turning blanks that are cut on the table saw with exactly straight and parallel sides will be gripped better than blanks that are cut approximately straight and parallel on the band saw. You can put coarse PSA sandpaper on the insides of the jaws to help them grip securely. Wooden Jaws don’t have the built in protection against opening the jaws too far that some standard jaws employ, so carefully check that the base jaws are sufficiently engaged in the scroll of the chuck body. 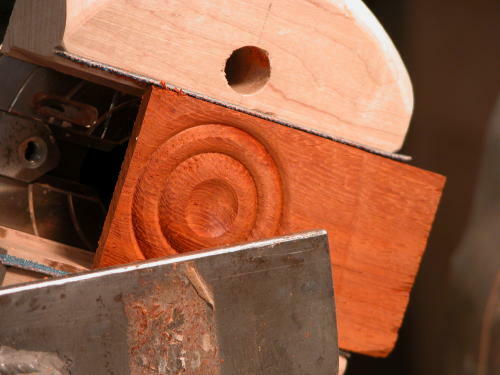 The simplest way to use the Two Jaw Chuck is to clamp a thin rectangular blank between the jaws using the small step. 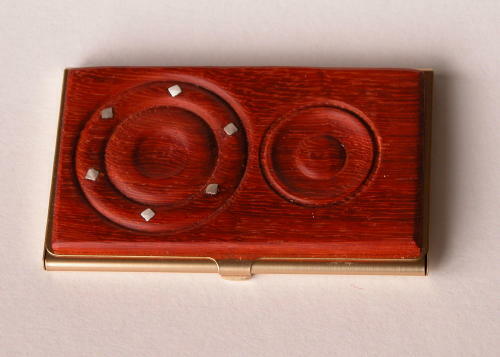 The companion article on making a Business Card Case illustrates this technique. You can offset the piece and turn a pattern, turn part of the piece on one center and the other side on another, or incise intersecting patterns. The permutations are endless. 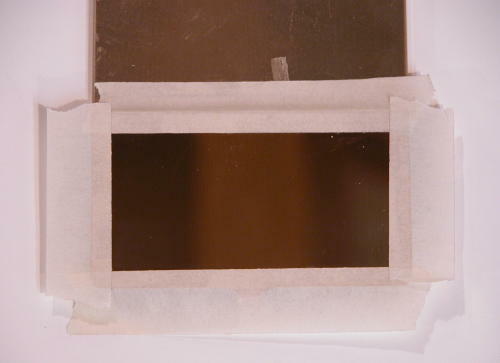 If you wish to turn the piece so thin that vibration becomes a problem, or want to turn something wider than you can comfortably open the jaws, then temporarily fasten your work to a scrap backup with two sided tape, a paper joint, or hot-melt glue. For small three dimensional work or for face turning where the piece does not remain rectangular, you can use a Glue Chuck held in the Two Jaw Chuck using the lower step. The companion article on making Kitchen Towel Holders illustrates this technique. If possible prepare your Glue Chuck on the table saw to insure straight parallel sides and thus maximum hold. You can select a chuck blank that’s a little deeper than the depth of the step to keep your fingers and turning tools away from the jaws. 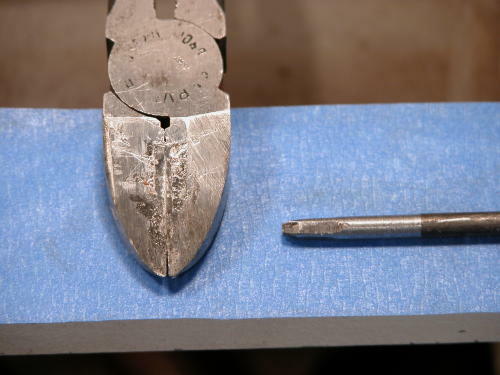 You may find that drilling a ¼” hole in the chuck after first mounting it in the jaws will serve both as knock-out rod access and a re-centering guide. 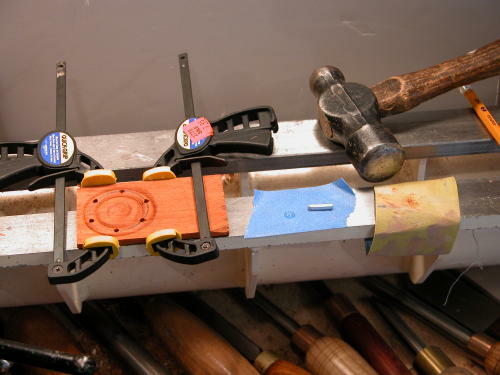 You can fasten your work to the chuck with two sided tape, a paper joint, or hot melt glue. Again the design permutations are endless. You can shift the Glue Chuck sideways in the Two Jaw Chuck and you can rotate the Glue Chuck using a common offset. The Glue Chuck doesn’t have to be square, if your design requires more rotations use a six, or possibly even eight sided Glue Chuck. Just remember as the number of sides goes up, the available surface area to hold goes down. You can also use the Two Jaw Chuck to increase the available deflection for offsetting the axis of a turning blank gripped between centers. 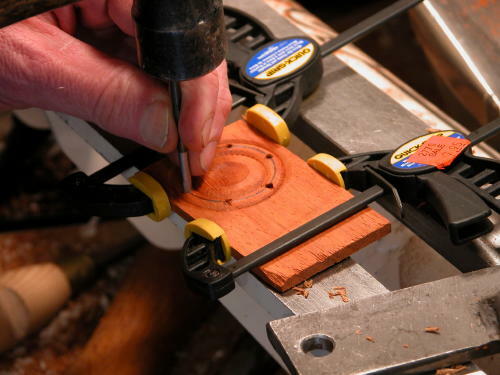 If you use ordinary drive centers you can only offset the piece as far as the edge of the work or a little less. With the Two Jaw Chuck you can use a larger offset, particularly with smaller turning blanks. Please don’t try this without the tailstock engaged. A small scrap block placed on the opposite side of the jaws will help both to balance the work and keep the jaws parallel allowing a more secure hold. The author, David Reed Smith, lives in Hampstead , Maryland , with his wife and increasingly part-time with his two children. His wife, whilst supportive, is less than perfectly tolerant of the state of his basement, and upon expressing a wish that I would live to clean it up, had to be shown an illustration of the “I’ll be turning in my grave” T-shirt. He welcomes comments, questions and suggestions via email at David@DavidReedSmith.com. 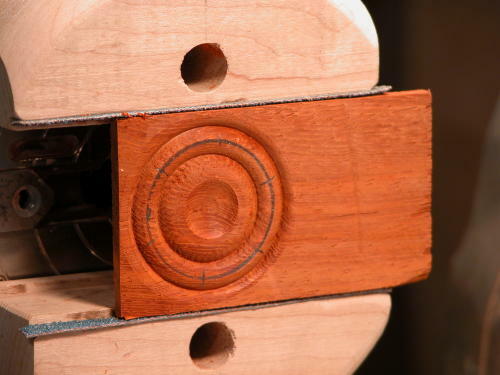 Thin multi-center or offset turnings make an excellent way to dress up ordinary objects. A brief browse through the Metalliferous (or other jewelry findings) catalog yields many ideas such as bracelets, money clips, cigarette cases, hinged boxes, even electrical switch plates. 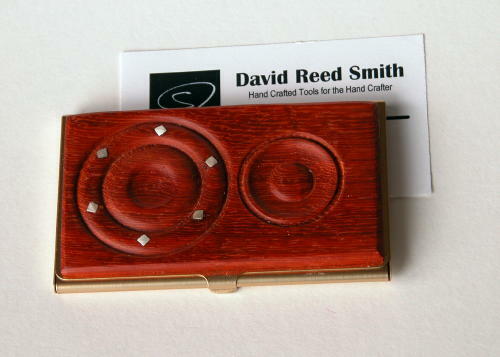 This article will illustrate applying a thin multi-center turning to a business card case. The first step is to measure the lid of the business card case. The brass one I got from Metalliferous was 2 1/8” by 3 5/8”. I wanted to leave a small rim of brass around the turning, so I cut a blank 2 by 3 ½” from some 3/8” thick Padouk. It’s a good idea to have the back surface of the blank glue joint ready before you start. If your blank is thicker than you want, clamp it centered in the two jaw chuck and reduce it to the thickness you want with a bowl gouge. This is easier to do with the blank centered, as you won’t be cutting as much air. Once the stock is prepared, mount it off center between the shallow steps. I moved it the distance that looked right rather then measured it, but it was about 3/4” or so. I started up the lathe slowly, and increased the speed to what seemed comfortable to cut with but slow enough to avoid excessive vibration. Next I used a pencil to mark my design, both to aide in cutting, and to make sure it all fit rather than running off the side. I then cut the first design, a dome with a dimple in the middle, and a surrounding bead with a small bowl gouge and a pyramid point tool. My design called for inlay of square silver wire at six equally spaced points around the bead. To prepare for the inlay I used a pencil to mark the center of the bead, and then used the headstock index to mark off six equally spaced spots on the bead. I measured the diameter of the 10 gauge square silver wire across the flats; it was 0.105”. A #36 drill is just a little bigger than that, so I used it to drill holes at the six marked spots. I drilled all the way through as the back won’t be visible. It’s easier to do the next operation off the lathe with some secure back-up, so I carefully marked the edge of the blank on the jaws so I could replace it to the same location. Unless you went to Vocational Kindergarten, you probably learned a long time that a square peg won’t fit in a round hole. That may be true for wooden pegs in wooden holes, but it can be a different story with metal pegs and a hammer. I helped this along by making a special tapered punch. I measured the 10 gauge square silver wire across the diagonals (it was 0.140”) and found a finishing nail that was just a little larger. I cut the head off the nail and chucked the nail in my collet chuck. A Jacobs chuck would work too, particularly with a draw bolt. 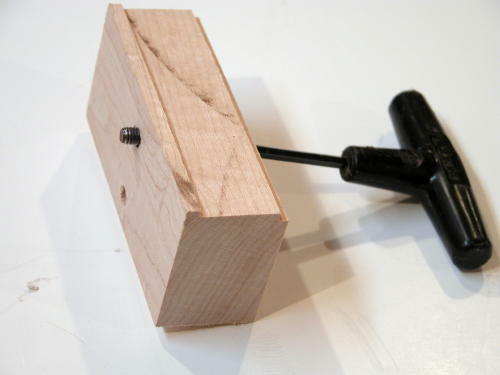 You could also glue the nail into a scrap block held with most anything. I turned the lathe on at a slow speed and used a flat file to reduce the last ¾” of the nail to 0.140”. Then I used the indexing head and the flat file and filed flats on the nail, aligning them with the existing tapered tip. I then laid the turning blank on the lathe bed, and reinforced it by clamping across the width with some small clamps to prevent splitting. Then I put the punch in a hole and tapped gently with a hammer. I withdrew the punch to make sure the diagonals pointed where I wanted, then replaced the punch and tapped until the hole was square at least part way down. I repeated this for the other five holes. To insert the silver wire I left the turning blank on the lathe bed, put a piece of masking tape next to it on the bed, and a piece of sandpaper next to that. I cut a piece of silver wire about an inch long with diagonal pliers. Holding the sandpaper down with one hand I moved the end of the silver wire back and forth against the sandpaper to remove the worst of the peak left by the pliers and to taper the end of the wire just a bit. I put a drop of super glue on the masking tape and rolled the end of the silver wire in the glue to put a thin coat on it. Then I tapped it into a hole with the hammer and cut it off as close to the wood as I could with the diagonal pliers. I repeated this for the other five holes. Once the glue had a chance to cure I remounted the blank in the Two Jaw Chuck. After making sure it was on the same center I sanded the blank. I started with 80 grit sandpaper, and had to be patient while the silver wire was sanded flush. Remember that sanding generates heat, that silver conducts heat well, and that heat will cause super glue to release. Had I made the bead bigger I could have used 1/8” pewter wire, which is softer and easier to level. I then sanded through progressively finer grit sandpaper. After finishing the first turning, I moved the blank over to a new center. I used a 1/16” parting tool, a bowl gouge and the pyramid point tool to turn a slightly smaller inverted version of the first turning. Again, I sanded through progressively finer grits of sandpaper. When the second turning was done I removed the blank from the chuck. Using a drum sander (hand sanding works too) I sanded and rounded the edges slightly. The final step was to apply finish. I used the same finish I usually use on the lathe, a shellac/linseed oil/alcohol mixture. I applied some finish to a rag rubbed it into the wood, and then buffed it out by hand. The finish can’t tell if the wood is moving or the rag is moving, although it takes a trifle longer because my hands don’t move at lathe speeds. The only remaining step is to glue the finished turning onto the business card case. My case came with a protective plastic film, so I removed that. I chose super glue to glue the turning on. I tried polyurethane first, but it even leaving a margin around the edges where no glue was applied, I still got some areas of foamy squeeze out, which was impossible to remove without scratching the brass. Super glue is super, but it still helps to properly prepare the surfaces. With metal this means abrading the surface of the metal to remove any oxidation, the texture or “tooth” may help the glue grip mechanically as well. 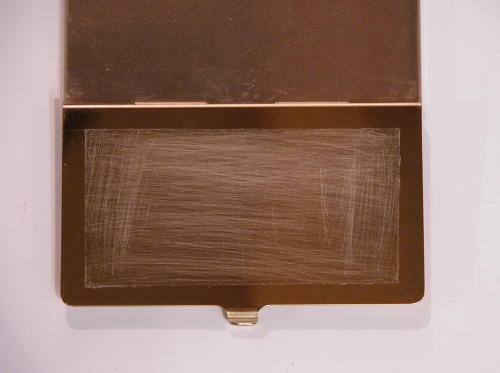 But I didn’t want to scratch the visible rim on the card case top. So I applied masking tape around the edges of the case top, using a bigger margin than would be left after gluing on. I abraded the brass surface with some fine sandpaper and then removed the tape. Even glue distribution also helps develop glue bonds, and you can’t depend on clamp pressure to adequately spread the glue over relatively large surfaces. I applied some thick super glue to the back of the turning and spread the glue out evenly using a piece of thin cardboard (Outdated credit cards work for this too). I placed the turning on the case and clamped it using using Irwin Quick Clamps. 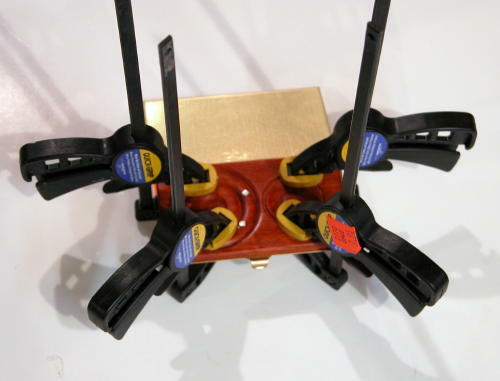 These clamps have built in pads. If you use something else you may wish to pad the turning and case with scrap wood cauls or leather to avoid denting your turning or case. Yes, super glue sets quickly, but it’s a big area. Use clamps. If you do see any squeeze out, remove it before it sets with a rag. Give the glue an hour or so to set and the case is done. The only thing left to do is fill it with your business cards and find someone to impress.